DEALERS Buy ATOMIUM online NOW! increase the car free run (in neutral gear). Retention of a denser oil layer on the surface reduces the frictional losses which increases the free run: movement the car in neutral gear. protect the gearbox against wear. Protective layer on the friction surfaces and dense oil layer substantially reduce wear and increase the lifetime of the unit. It is not expected any health hazard when used under normal conditions. In case of a contact with skin, wash out with warm water, and then wash again with soap. In case of contact with eyes, wash out eyes with large amount of water. In case of swallowing, consult a doctor. Shelf life: 5 years. Manufacturing date is indicated on the can. It is not recommended to apply the compound at existence of mechanical breakages of parts and assemblies. 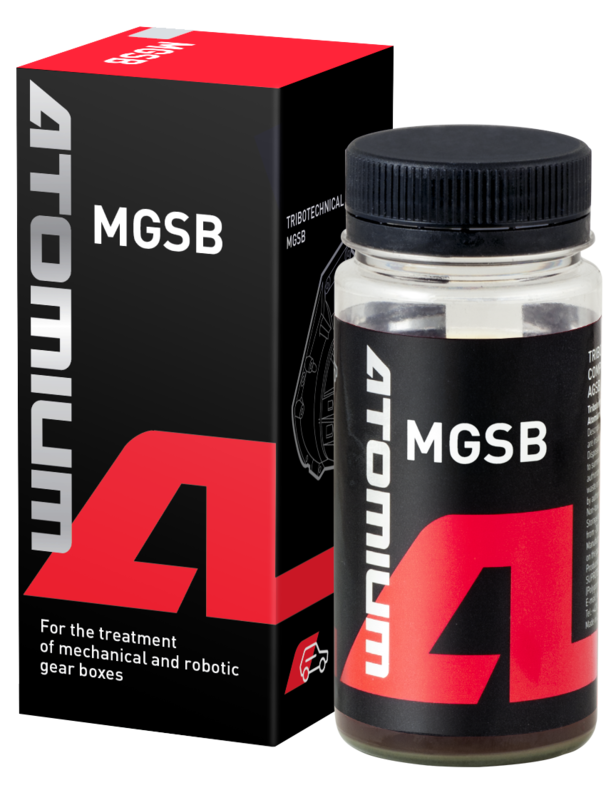 Compound Atomium MGSB is compatible with any type of transmission oils, including ATF based oils. 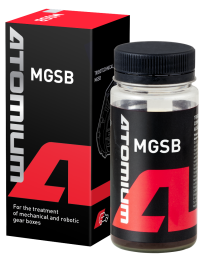 1 can of compound Atomium MGSB is enough to treat any gearbox with transmission fluid volume up to 4.5 liters. The sediment on the bottom of the can is the main working element of Atomium MGSB - these are microparticles of minerals. It is crucially important to stir the contents of the can thoroughly before pouring it in the gearbox oil system (sediment color depending on the release batch can vary from light green to black). Compound MGSB does not interact with friction clutch, does not affect the friction clutch wear and performance, does not prevent friction clutch problems. Overdose of compound by 1.5-2 times is not dangerous for the gearbox and does not disturb its work. Compound MGSB does not affect the characteristics and status of parts made of composite materials and rubber. Warm up the gear box up to operating temperature (regular operation). Stir the contents of the can thoroughly until natural sediments (active components) are totally dissolved. Fill the gear box through the regular oil filling neck with 1 can of compound MGSB . Immediately after applying it is recommended to drive the car for no less than 20 - 30 min in the regular operation mode. After the procedure, you can use the car as usual. To provide continuous level of protection of the gear box it is recommended to apply MGSB after each scheduled transmission oil change.